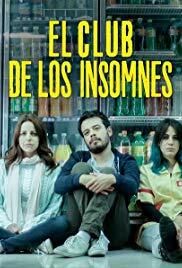 El Club de Los Insomnes opens with office worker Santiago telling his therapist about the nightmare he keeps having. He runs for his life in a parking lot and then comes to a halt before a bright light just before he wakes. To escape the nightmare each night Santiago goes to a 24-hour mini mart and hangs out with aspiring photographer, Danny. They play word games between sales and the one who loses the game must dance. One night veterinarian Estrella arrives at the mini mark. She is in a daze over a surprise pregnancy. As the film progresses Estrella changes the relationship between Danny and Santiago for the better and they offer what she needs as she struggles with her pregnancy. This charming Mexican film affirms the close bonds of friendship and the positive effects it can have.